July 27, 2018, Dublin, Ireland. 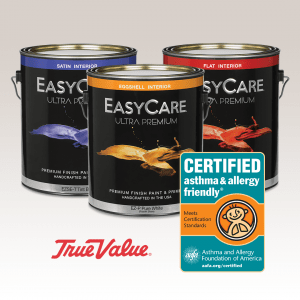 Allergy Standards Limited (ASL), the International standards and Certification Body (CB) for allergy labelling, today announced that EasyCare Ultra Premium Acrylic Latex Paint by True Value Company has passed the relevant Certification Standards. How did the EasyCare Ultra Premium Acrylic Latex Paint obtain the Certification? This ASP: 04-01 Certification Standard is targeted to paint products that are scientifically proven to reduce exposure to asthma and allergy triggers. The Certification Standard utilizes an algorithm of proprietary and recognized scientific techniques to assess paints for their ability to reduce allergenic and irritant materials. Product samples that pass certification testing are granted a certificate stating that the particular paint item meets the requirements for the asthma & allergy friendly® ASP:04-01 Certification Standard. ASL subjects interior decorative coatings to chemical testing to ensure that the product does not have properties that are likely to irritate both asthma and allergy symptoms in susceptible people. True Value Company then obtained the certification after the products they sent for testing passed the tests and met the scientific requirements. True Value Company, headquartered in Chicago, is one of the world’s leading hardlines wholesalers with a globally recognized brand and over 70 years’ experience serving independent hardware retailers. True Value Company provides its customers in over 60 countries an expansive product set with market-customized assortments at highly competitive prices, superior product availability, innovative marketing programs and a la carte value-added services like eCommerce ship-to-store, store remodel support and True Value University all within a flexible model which requires no membership.